Alex Hern reports on the projection that the British economy will fall into recession in 2012. Economists at Standard Chartered have released their predictions for the state of the British economy in 2012, and they make for grim reading. The UK economy is likely to be in recession going into 2012 as the negative impact of fiscal tightening and falling real incomes is compounded by a downturn in demand from the UK‟s largest trading partner, the euro area. We expect GDP to contract in [the first half of] 2012, before bottoming out and eventually recovering in [the second half of] 2012. The euro area is expected to experience a 1.5 per cent contraction of its own. However, not every major economy is expected to go into recession. The US is expected to maintain growth of 1.7 per cent, and Australia and New Zealand are predicted 2012 growth of 2.9 and 2.4 per cent respectively. Although higher than Britain, none of those figures are good. They remain below the long-term trend, and below a comfortable level of growth for advanced economies. The longer term is better, but not much. Standard Chartered forecast 1.5 per cent growth in 2013 and 2.3 per cent in 2014 – which, if true, will necessitate further cuts in the OBR’s forecasts. The most recent OBR predictions were 2.1 per cent for 2013 and 2.7 per cent for 2014, and a 0.6 and 0.4 base point cut in growth will certainly harm the chancellor’s attempts to cut the deficit. The difference between the OBR forecast of 2.5 per cent in 2012 and the Treasury’s collation of independent forecasts, which projected 1.1 per cent growth, was massive when applied to the attempts to cut the deficit. With growth predicted as -1.3 per cent, rather than 1.1 per cent, it looks like any attempt to cut the deficit to even near that called for by the Darling plan is likely to be nigh-on impossible. 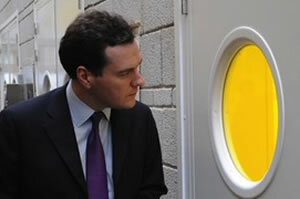 The chancellor ought to start planning for a deficit to be maintained for quite some time. What can you say about this, out of the frying pan into the fire ? What is it going to take for the government to change course? Losing a general election. Any other easy questions?